Nicholas' Touch: Over The Top! I was given an "Over The Top" award from Kristy at I Love You To The Moon and Back. Thank you for the recognition. And of course I need to pass it on to other fellow bloggers. 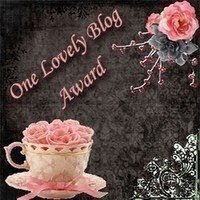 Kristy also awarded me the "One Lovely Blog Award". It means so very much to know that others are reading Nicholas' story and that maybe we can help support someone along the way. I am supposed to pass this on to deserving bloggers I read. I follow so many wonderful blogs. Well written, passionate, raw and emotional. You are all my "soul sisters"... I swear. This community has been one of my life lines through this shaky journey. I thank you all and I love you all for taking the time to stop by Nicholas' Touch and The Angel Wings Memorial Boutique. It's impossible to only choose a few blogs that I identify with, but I have to follow the rules. Congrats and thank you for passing it on! !